Hi there! My name is Katie Lolas and I am a full time teacher and passionate health and fitness blogger with a loyal following of over 140K+ over both my Instagam @lady.lolas and blog www.ladylolas.com. I’m often asked for advice about how to live a balanced and healthier lifestyle. Many times the questions come from busy people who have good intentions, but just can’t seem to find enough hours in the day to sleep, work, spend time with family, exercise AND eat well. With three weeks to go until City2Surf I thought I should share my number one suggestion for people who are having trouble staying on track during the week is meal prepping! 1. Look at your schedule for the next week and make a list of everything you want to prep. I personally prefer to prep 4 x breakfast and lunches. 2. Choose simple familiar recipes with few ingredients to start off with and once you feel confident you can get more creative. One of my favourite go-to recipes for breakfast is my Overnight Oats because they’re nutritious and easy to make and taste delicious. 3. Create a shopping list of ingredients you will need before you go shopping. 4. Ensure you have enough containers to store your prep. Add anything you require to your shopping list. 5. Get shopping and don’t forget your list! 6. Dedicate a specific time needed to cook and create your meals. I like to prep nice and early on Sunday mornings, which frees up the rest of my day. Meal prep really is the most under-rated and under-utilised healthy living tool. Making it a habit to spend even just one or two hours on the weekend to prep food can make a huge difference in your food choices during the upcoming week. 1. Shop for seasonal fruit and vegetables to save money and keep your eye out for what’s on special to inspire your menu. 2. Instead of counting calories to create the perfectly balanced meal use the following portion method: 50 per cent of your plate should be made up of colourful vegetables, 25 per cent with a lean protein, and the last 25 per cent with a Low GI Carbohydrate.
. Most leftovers are only safe in the fridge for 3- 4 days, so don’t prep more food than you can finish by Thursday if you’re meal prepping on Sundays. If you reach Tuesday or Wednesday and realise you have too much food you can always freeze a couple of things depending on what you’ve made. 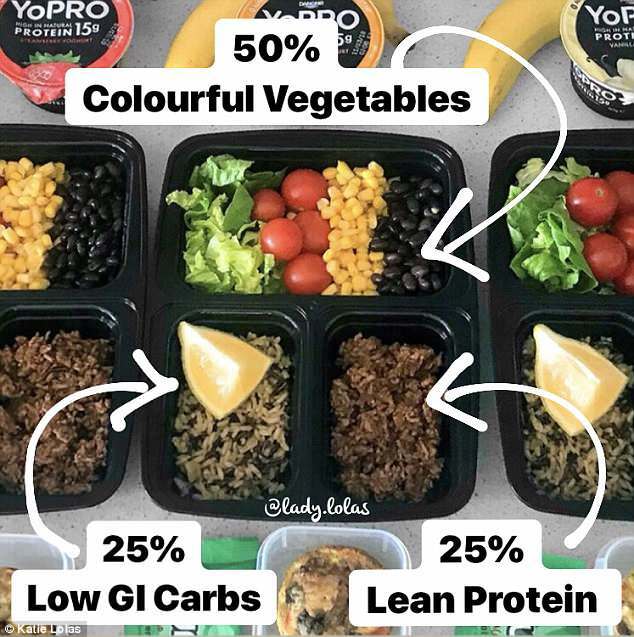 If you liked this post, follow @lady.lolas for regular meal prep inspiration and additional tips and tricks. Or check out my website www.ladylolas.com for recipes to get you started, including my favourite Honey Soy Marinated Chicken with Sweet Potato and Chickpea Mash and Fajita Chicken Soup.